*Note: The NL is an absolute crapshoot this year. With the exception of the Marlins, there is a path for every team to make the playoffs. It is going to be a wild ride! Thunderhead is the second book in the Arc of a Scythe series from Neal Shusterman. It continues the story of Rowan and Citra as they continue to fight the growing greed and corruption in the ranks of the Scythedom. This story introduces new characters as well as bringing back some of the old favorites. Despite her unwillingness to accept it, Citra is growing a following and establishing herself as a leader within the ranks of young Scythes. Her unconventional gleaning routines have caused a stir across the Scythedom, and she has become a target for those disapproving of her ways. Scythe Curie continues to mentor Citra, but through this mentorship has become a target as well. Meanwhile, Rowan is trying to bring down the corrupt Scythedom one corrupt Scythe at a time. But his vigilante ways have angered many, and an old friend plans to put a stop to Rowan and make him pay off his debts. Throughout it all, the Thunderhead watches. Unable to interfere in the matters of the Scythedom, the Thunderhead must find a loophole to try and stop what only it can see coming. But a computer, even one as great as the Thunderhead, is limited in its capabilities. A train is flying uncontrollably down the tracks, and there may not be anyone, human or machine, who can stop it. The first half of Thunderhead nearly put me to sleep. As the story is being built, and new characters and character arcs are being introduced, my interest waned. The narration before each chapter by the Thunderhead itself was unimaginative, oddly worded to sound more mechanized, and left me uninterested. However, what the first half was building toward was well worth it, and as I made my way into the second half of the book, I could not put it down. The pace increased, the narrative shifted, the writing became more interesting, and the story sucked me in. Scythe was a challenging book to follow. 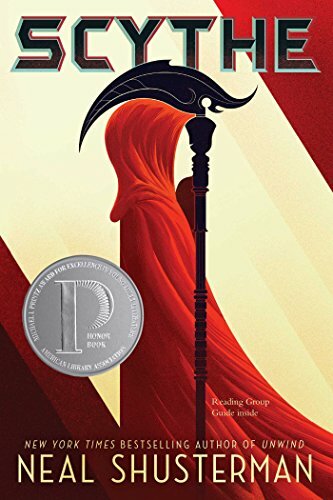 A unique and interesting take on a dystopian novel in a world of dystopian novels, Scythe stood out. Now, Thunderhead picked up the mantle, and despite the slow start, carried a strong second act leaving me anxious for book 3. The ending of this book will both enthrall you and anger you and leave you not just wanting more, but needing more. Zer0es, by Chuck Wendig, is a redemption tale for five hackers. Black hat hackers blackmailed into turning good come together to help the government – or so they thought. Soon they find themselves in a life or death situation to stop the computer program Typhon from infiltrating all aspects of modern civilization and essentially taking over the world. 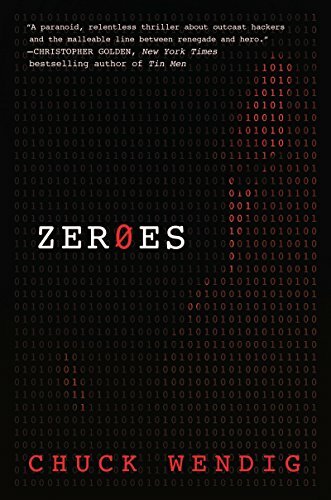 Zer0es is a fast-paced thrill ride that will leave you questioning whether our growing dependence on AI is truly worth the risk. Zer0es is the first Chuck Wendig book I’ve read (besides books on writing), and I am surprised I have not read more by him. I enjoyed this book, but I especially enjoyed the beginning – which focused more on the actual hacking – as opposed to the end. The second half of the book turned into an odd terminator-like action novel with the hacking details a thing of the past. The beginning of the novel gave me nightmares more so than any horror book ever could. The ease at which it seemed these people could hack into someone’s account or steal their identity or ruin their life seemed extremely realistic and, admittedly, I went and changed some of my passwords. Books are made by their characters, and each character depicted in this novel had their own interesting background and separate hacking story. This made the novel very enjoyable as the characters spent more and more time with each other, letting their personalities out. Most of the characters continued to grow on me as I learned more about them (Aleena, for one, is a badass), except Reagan, who I found to just be annoying and found myself wanting to fast forward any time she would speak. I listened to this book on Audible and the narration was phenomenal. Ray Chase’s narration added a fun element to the story that enhanced the listening experience. I would definitely recommend listening to this one. The sequel, Invasive, was released in 2016, and I am adding it to my to-be read list for future reading. Zer0es foreshadowed some of the action that is to come, and I am excited to see what happens. I have seen this challenge going around and checked out Caffeinated Reviewer for the details. I always listen to an audiobook before bed, on the way to work, on walks etc., so this 2019 challenge seems right up my alley! Plus, with the discovery of the 1.5x reading rate option on Audible, I plan to put down some books this year. Setting a goal for at least somewhere between Socially Awkward and Binge Listener. You can sign-up for the challenge by clicking here. I’d love to hear some other people’s goals and have a little competition. Competition always helps to drive me. 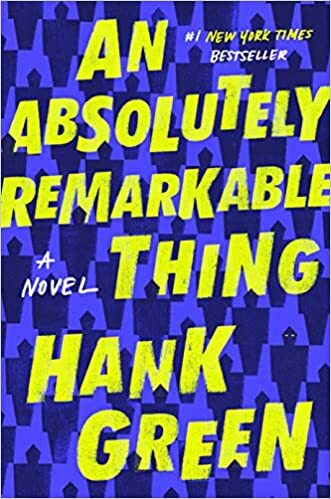 An Absolutely Remarkable Thing by Hank Green tells the story of April May after she makes an incredible discovery and turns into a celebrity overnight. Late in the evening one night, April comes across a strange robot statue-like thing in the middle of New York City. Eliciting the help of her friend Andy, April films herself with the statue (which she has named Carl), and they upload the video to YouTube. Quickly, April reaches new levels of fame as she discovers more and more about the strange Carls which turn out to be not of this Earth. The story follows April as she copes with the ups and downs of celebrity, social media, and relationships all while trying to discover the meaning behind the Carls. An Absolutely Remarkable Thing is a New York Times Bestseller written by Hank Green, the brother of John Green. Green has a long history of YouTube success, and An Absolutely Remarkable Thing is his debut novel. A follow up novel is believed to be planned, but there is not a lot of information out publicly yet. My first book of 2019 turned out to be a dud. An Absolutely Remarkable Thing has received a lot of praise since its release on September 25th of last year, but I found the book to be somewhat boring. It might have been because the name Carl for the randomly appearing space robots was somewhat off-putting, and I’m not sure why everyone would refer to invading alien robots by that name, including the president of the United States, or it may have been the fact that I did not find April May all that interesting. I am not in the habit of detailing every single thing I did not like about a book. Many people enjoyed this book, but it was not for me. I am a big science fiction fan, but the sci-fi was often subtle and backgrounded for a large portion of the book. There is nothing wrong with that, the main theme seemed to focus on April and her friends coping with her ever growing celebrity and the challenges fame brings, but that is not as interesting to me. A sequel is planned as the ending left on a giant cliffhanger, and there are a lot of questions left to be answered. The end of the book did not feel satisfying to me even despite the purposeful nature of ending on a cliffhanger. I guess in the end I did not really understand the purpose of the novel, the Carls, or the dream. I may have missed it, and will have to do a reread before the next one comes out as I am sure much of that will be answered in the coming book. Next up for me Fire & Blood by George RR Martin. I cannot wait to get back to Westeros and learn a little more about the Targaryens. I am a huge science fiction fan, but for some reason I had not read much Scalzi before this (last?) year. I took care of that by reading nine Scalzi novels this year. The Old Man’s War series was probably my favorite (I read 4 of the 6 full length novels so far), but I really enjoyed Lock In and Head On, as well as The Collapsing Empire books. Ironically, my least favorite was probably Redshirts which won the Hugo award in 2013. Old Man’s War follows John Perry who, like many 75 year olds, joins the army, known as the Colonial Defense Force. He is sent into space, given a new and enhanced body, and sent off to kill aliens. This story opens up a world of planets, species, and adventures that are fun, creative, and interesting. 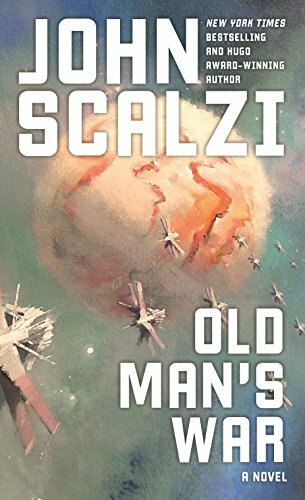 Scalzi creates a brand new and complex universe that feels plausible, and that is one of my favorite aspects of science fiction. You want to know more about the characters, especially the aliens, and that keeps you reading. Ok, admittedly, one of the reasons this isn’t higher on my list is that I was angry when I finished it, because I know the third book wasn’t out yet and I want to get back to this world ASAP. The flashback nature and foreshadowing of Kvothe’s story is what intrigues me the most. He is a worn down, lowly innkeeper as he tells his story, but his story is a build up of his greatness. At some point everything will have to come crashing down, and I’m intrigued to see how it will happen. 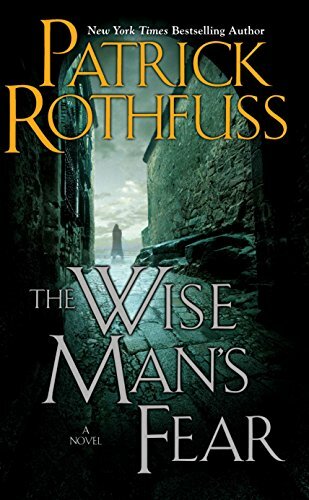 Rothfuss has also stated that the three books in the story are more like a prequel, so it will be exciting to see how the third book transitions into the current time period where Kvothe is telling the story and struggling. One of my goals in 2018 was to read more books by diverse authors. I didn’t feel like I accomplished this as well as I could have, but I am adding it to my reading goals for 2019. 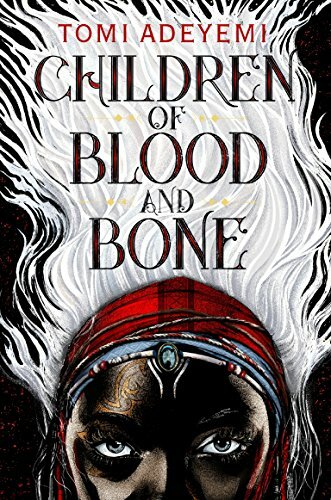 Children of Blood and Bone was an extremely fun story. A story based in African mythology, I loved Adeyemi’s world that she built. The next book in the series Children of Virtue and Vengeance is due out in March, and it will be exciting to see how the story continues. The dynamic between the main character Zélie and the prince chasing her, Inan, was extremely compelling. Zélie, similarly to other characters in the books I enjoyed this year, is another strong yet flawed protagonist. For many of these characters, they put themselves in perilous situations due to their flaws, but they grow and change and become the person they are destined to be. This book had one of my favorite covers of the year as well. A young adult novel centered around the legal murder of people. How’s that for an intro? In Neal Shusterman’s future world, humans have conquered death. It is Giver-esque in the way that people don’t feel pain, no one is starving, or thirsty. But that’s because Scythe’s are there to help curb the population. Scythe follows the story of Rowan and Citra, who are chosen to be apprentices to a Scythe. They must learn the art of killing, yet master the why of it as well. Scythe is an emotional rollercoaster that has you questioning right and wrong, fair and unfair, as well as whether we even should try, as a society, to become masters of death. Shusterman leaves you wanting more, and Thunderhead was released in 2018 as the follow up to Scythe. Another on my to-be read list for 2019. Scythe was the first Shusterman novel I had read, and it made me want to check out some of his other works. I read Dry, written with his son Jarrod, but I did not enjoy that nearly as much as Scythe, and I don’t recommend it. There are two more books in this series after the conclusion of the original trilogy, but Morningstar (Book 3) closes out the first arc in Darrow’s story. 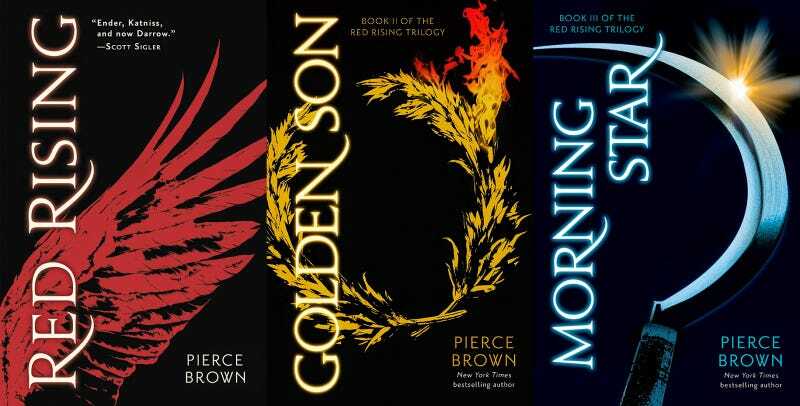 Book 4, Iron Gold, is on my to-be read list for 2019, but it continues the story some ten years after the conclusion of book 3. One of the most frequently asked questions about reading and writing is what makes a good story? Plot is important of course, but the true draw of a great story is character. If a character is boring, then it doesn’t matter how good the plot is, the story just won’t be interesting. Darrow is one of my favorite characters. Some criticism I’ve read regarding Darrow is that he is too perfect, or he is too good at everything, he’s a wunderkind and that’s boring. But that’s not how I see Darrow. He is extremely flawed, and that is what makes him so compelling. I want to avoid any spoilers or details about the book, because if you like science fiction, I highly recommend reading it, but Darrow’s rises and falls (there are many throughout the book) is what drew me in. He is intelligent, inspirational, and driven. But that’s also his flaw. He is dependent on his friends and allies throughout all three novels, and that idea is central to the very nature of the story. I found myself feeling emotionally invested in Darrow’s fight, and an emotional connection to a story and a character is what makes reading so incredible. I never wanted to leave Darrow’s world and always wanted more. In short: Read this book. Reaction: Not bad. The Indians were the easy favorite. Those final three teams could have ended in any order. They were all terrible, combining for over 300 losses. Reaction: I was really disappointed in the Angels this season. They did finish just below .500, but were not very competitive all year. They continue to waste the best player in baseball. No words for what the Athletics did. Extremely impressive. Reaction: I got the Marlins right! I thought the Braves needed one more year. That was incorrect. That is a scary team for a long, long time. The Nationals were a shocker. I still don’t know how they did not make the playoffs with that team. The Mets on the other hand was my bold prediction to get to the playoffs, but they are the Mets… injuries are just killer to that team. Maybe next year?? I still don’t want to talk about it. And remember when the Cardinals added Paul Goldschimdt this offseason?? Cubs please do something cough *Harper* cough. Reaction: The Rockies were my bold prediction to regress and I was way off (early prediction for 2019 – Rockies will have massive regression). Their pitching held up surprisingly well. Marquez looks like a beast, the metrics are interesting on Freeland, but they definitely proved me wrong. The Giants were the huge disappointment here. Reaction: WOOO! I finally nailed a prediction. Ohtani and Acuña were well deserving award winners for Rookies of the Year, but Juan Soto made that a close one until the end. As for MVPs, Correa had a disappointing campaign due to injury, but what Betts, Trout, and Ramirez did this year was incredible. Harper had a solid year, but not the kind of year I was expecting from him, and, again, I don’t want to talk about the Brewers and Yelich. Finally, as for the Cy Young, Syndergaard had trouble staying healthy but a Met did win it so that’s kind of close…Sale was hands down the best pitcher in the American League. It was the best year of his career. He had injury issues and only threw 158 innings, yet he was second in the AL in WAR, led the AL in K/9, and had a great walk rate. Snell had a fantastic year, but even with the injury issues I thought Sale deserved it. He was the best pitcher in baseball. That should equal Cy Young.